The aim of this report is to share insights from the California experience with advocates, program operators, and state agency, school and political officials in other states who are contemplating an expansion of afterschool programs. This report is the result of a desire by the William T. Grant Foundation to capture a unique process and opportunity -- the planning for the largest expansion of state-funded afterschool programs in the nation's history. 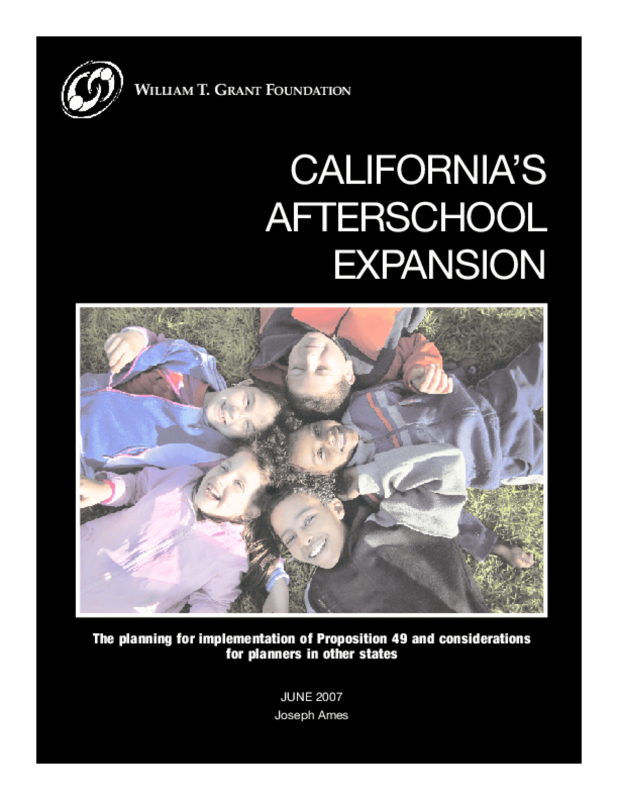 This report covers the time period from summer 2005 to late summer 2006 when legislation sets the stage for the implementation of Proposition 49, which funds afterschool programs for elementary and middle school students. 1) Documents generated during the planning process. 2) Observations during meetings of two key groups. The Design Team: This group was comprised of state agency officials, program operators, advocates and employees of a consulting firm. This team produced 19 recommendations on how to implement Proposition 49. The Before & After School Advisory Committee: This committee was created by the California legislature. One of its roles is to review the work of the Design Team and make recommendations to state agencies, the governor and the legislature on how to implement Proposition 49. 3) Interviews with 15 people involved in the process. These people were chosen to serve as archetypes because their point of view represents large numbers of stakeholders. This report addresses two major issues that drove the planning for the rollout of Proposition 49. The first is the extraordinary expansion of a state-funded program. The number of sites would increase from 1,700 to 4,000; an additional 16,000 new afterschool staffers would be needed. The second issue revolves around the decision by a consortium of foundations to pay for a private consulting firm to work with state agencies, advocates and program operators to create a master plan. This yeasty mix -- nonprofits, business and bureaucracy -- created predictable cultural challenges when the main sectors of American working life team up to tackle a big job. Real answers to what worked in the planning process and what didn't will begin to reveal themselves once Proposition 49 is fully implemented. At that point, one will be able to see which parts of the plan were implemented and how well those plans succeeded in the delivery of afterschool programs. Copyright 2007 William T. Grant Foundation. All rights reserved.